I’ve been pretty excited about, finally, starting our orchard. I researched strategies for planting orchards and visited a few. The sources of information that have, more or less, influenced my design include: permaculture, food forests/David Jacke, restoration agriculture/Mark Sheperd, key line design, Penn State Extension, holistic orchard/Michael Phillips, the permaculture orchard/Stefan Sobkowiak, and of course, my friends who grow food. Stefan Sobkowiak’s work really helped to focus my efforts on the actual planting design after I made the decisions regarding earthworks. He has a very good DVD for sale. We have a lovely gentle southerly facing slope on the west side of the lower pasture above the pond. I decided to put the orchard up-slope of any pooling water, north of where the woodlot shades the pasture, and up-slope from where I observe cold damp air to collect on frosty mornings. I’m planning to clear the overgrown fence line at the border of the woodlot to promote drainage of that cold moist air. The first step I took was to do slightly off-contour subsoiling to reduce compaction. We measured 4 lines, approximately, where the planting beds would be and “drew” a line at a rough 1% grade from the northeast down to the southwest. 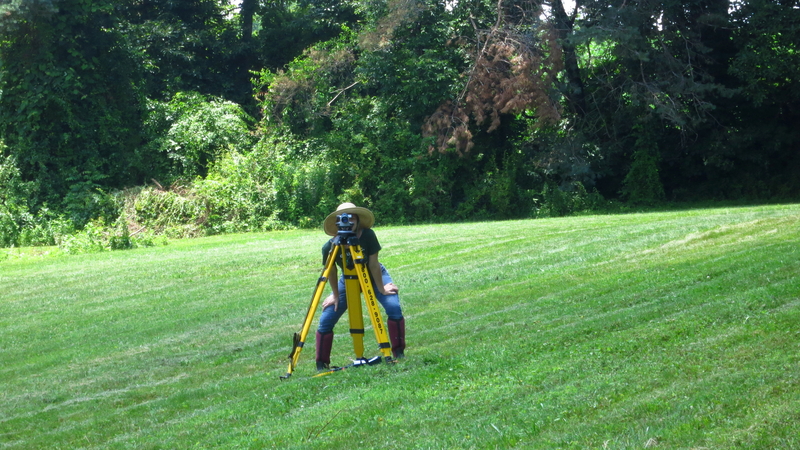 My daughter, Hannah, helped with the optical level and flagging points every 25 feet. 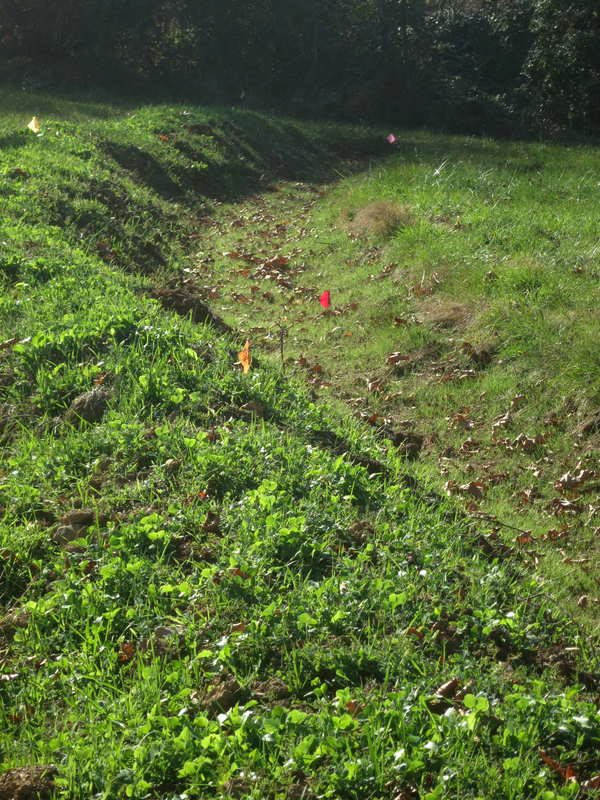 The pattern of subsoiling was based on the flagged lines. I started at the lowest line. I followed it with the tractor pulling a single tooth subsoiler which does not turn the soil over but creates a furrow. From there, I moved up the slope about the width of our tractor. With each pass, I created a furrow (probably, getting about 10-12″ deep) parallel to the line below. When I reached the next flagged off-contour line, I would work upslope parallel to that line. It came out real pretty. I understood that the scale and the climate and the topography did not call for a true application of key line design; however, this exercise helped me to work through the concepts to understand them more clearly. I don’t know what, if any, effect that these little furrows will have. I am hoping that, besides reducing compaction; that they can slow water and guide it, gently, over the contour of the landscape and deep into the soil; helping to prevent erosion and to nurture growth. Thinking that our drainage was good based on our soil survey and observations; I decided to dig my swales on contour to capture water and nutrients and organic materials. We have a front end loader with teeth, so, that is what I used to dig the swales. It was a rough cut. I had to go back with pick and shovel to clean up. An excavator would have been preferred but I got the job done. The rain came and the swales did their job of collecting water. The drainage wasn’t quite as wonderful as I had hoped. 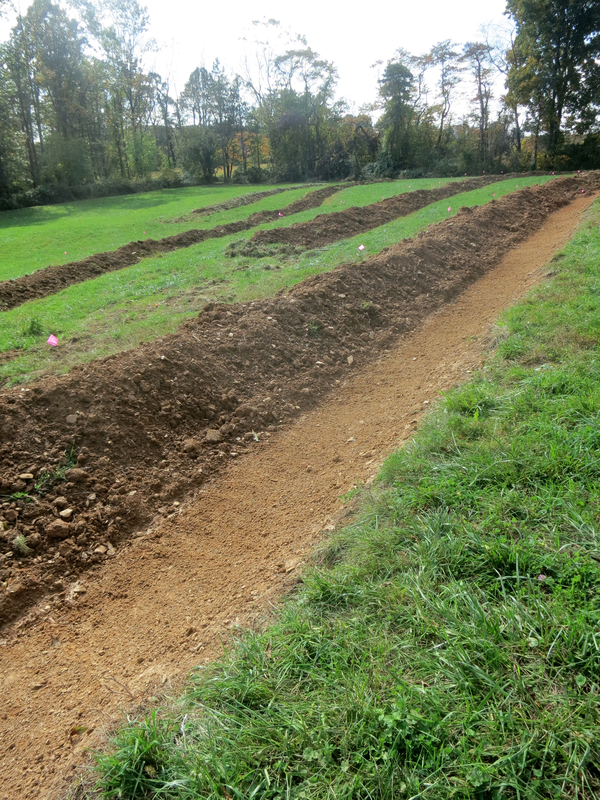 I am pleased that I have these raised berms for tree planting. I’m envisioning that, over time, as plants and trees and shrubs begin to grow and organic materials get put down; the soil will improve and store the water in a more useful way. 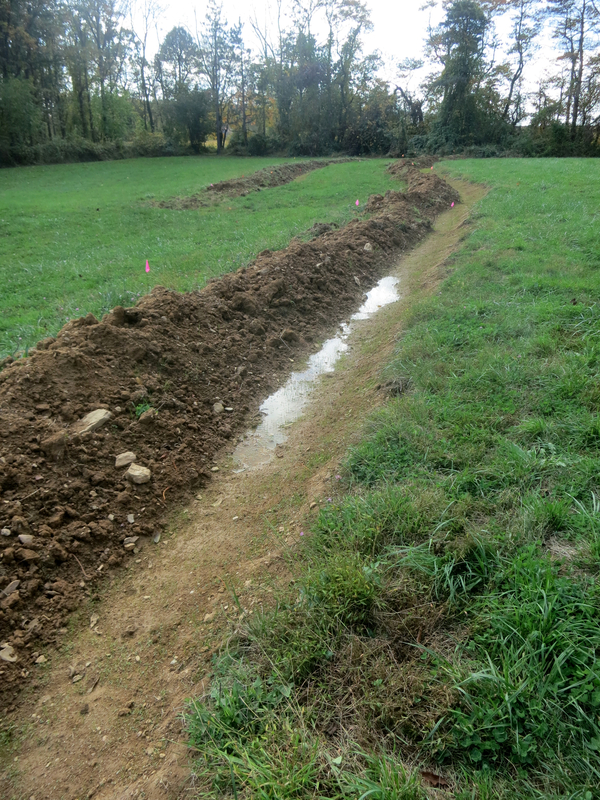 Meanwhile, I dug some drainage and overflow ditches that will preserve the berms in heavy rainfall. My future son-in-law, Paul, and I, roughly, shaped the beds and I planted it out with cover. 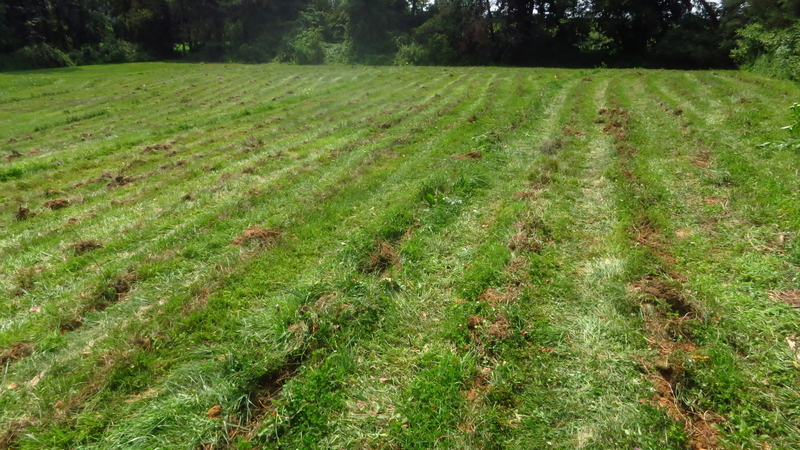 It was getting late in the season, so, most of the berms have winter rye and the swales have a lowland pasture mix. They got a little greened out before the cold hit. I planned our orchard on Sketchup. The berms make up about 570 linear feet. The to-be-fenced-in area will be just under 1/2 acre. I placed marker flags in the soil and ordered my trees. 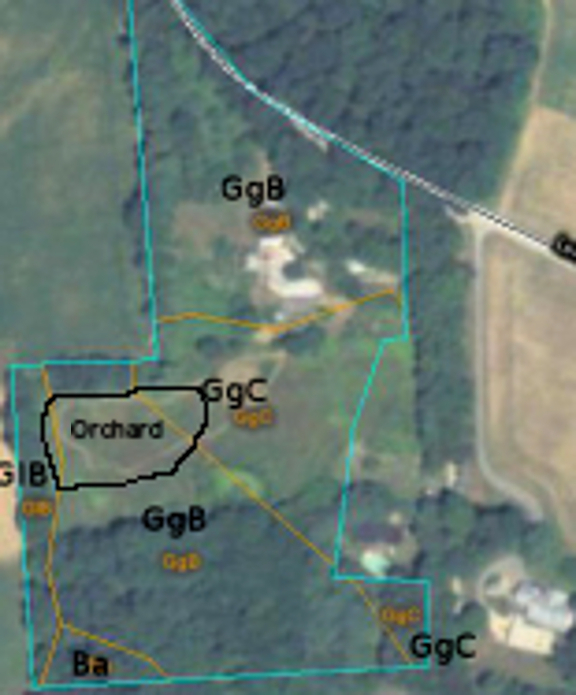 Stefan’s permaculture orchard suggests planting a mixed orchard in trios which include an apple, a pear/peach/plum or other fruit tree, and a nitrogen fixer. One of the benefits of this strategy is that the mixed planting will tend to interrupt the movement of disease from one tree to another. I sure had fun and took a lot of time picking out the varieties of trees and shrubs to plant. I am envisioning a paradise of fruit! I picked varieties that can tolerate a bit more moisture for the lower areas. The alders, which are supposed enjoy quite a bit of moisture, were put right down into the swales. A couple of weeks ago, I planted my bare root alders (Alnus glutinosa), serviceberry (Amelanchier canadensis), and american plum (Prunus americana.) My next plantings will be in the spring and I will finish the tree planting next fall (2015) with the apples. Here is a list of the trees and shrubs that I’ve ordered. I, initially, chose to graft the apples onto EMLA 7 semi-dwarfing rootstock; though, I am reconsidering. I may switch to EMLA 111 because it is supposed to be more adaptable to reduced drainage. The jujube are ordered as rootstock and scion wood which I will graft myself. I will, over time, plant annual and perennial herbaceous plants between and around the primary trees and shrubs. They will serve to support pollinators and beneficial insects, help build a deep and healthy soil, accumulate nutrients and fix nitrogen, and cover and protect the soil. Some of these plants will be very useful and delicious to humans as well! In fact, I expect that I will be planting my squash up on these berms next year while the trees are very small and when I need a vigorous ground cover. Stefan, recommends a special type of training for fruit trees which limits, greatly, the need for annual pruning. He finds that when branches are trained below horizontal; vigorous upward growth is avoided and more fruiting is promoted. This technique may prove to be very useful. I came into some interesting information about growing orchard fruit in silty loam soils as we have. Eliza Greenman suggests in her article that, in our type of soil and humid climate (she describes a humid Virginia climate), the fertility and moisture held in contoured swales can encourage a lot of vigor, too much vegetative growth and fewer fruit. Very interesting! We’ll see! The next step before spring planting is to get the fencing in. We have deer and they will, certainly, kill off the young trees. I have decided to install a 3-d fence. I am a beginner. It is exciting to move from reading about something to applying that knowledge. There are many confusing moments and mistakes seem inevitable. Happily, I’ve got these visions of plums and apples and sea berries and jujubes and peaches and persimmons dancing in my head. We are going to grow an orchard! Addendum: After some correspondence with Big Horse Creek Farm (the farm that will be supplying my apple trees), I’ve decided to go with MM.111 rootstock. 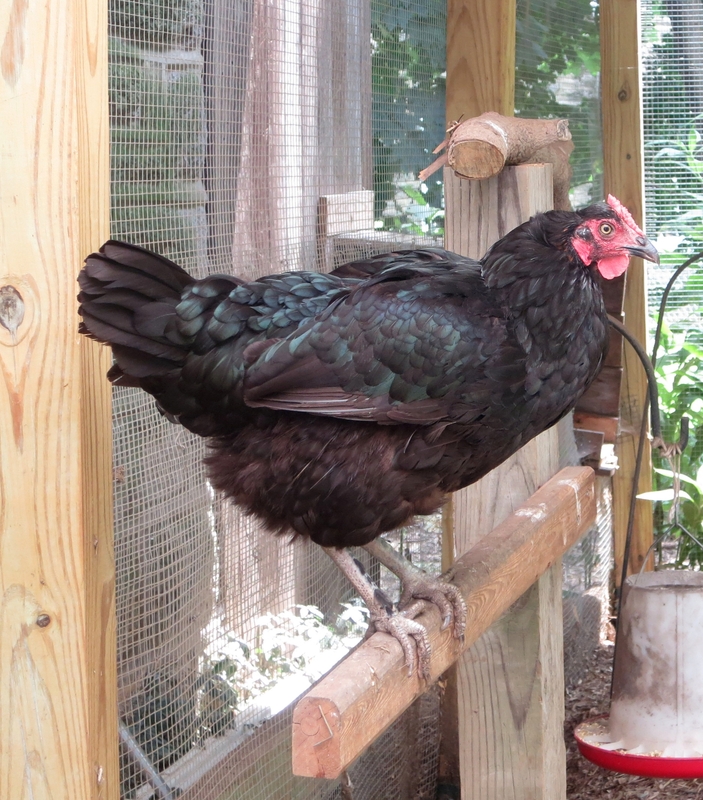 They have been very helpful and I look forward to planting the apple trees in fall, 2015. Great! Good luck, look forward to your progress. I loved reading every word, feasting on the photos. May this sweet place be abundantly blessed! I can’t wait to take a walk with you through the orchard one spring when the trees are in bloom! Have a beautiful holiday, Rita! WOW! This is amazing! You have done this very thoroughly.